SEGA vs. SGTC: SEGA is most commonly known as the brain neoplasm associated with TSC (18, 24, 28). Historically, these tumors were considered to be astrocytomas. Recently, SEGA has been called subependymal giant cell tumor (SGTC) because the cells of the tumor can be of mixed types, rather than being restricted to astrocytes. Both terms, SGTC and SEGA, are used in the medical literature. WHO Grade: SEGA is a WHO grade I tumor. Site of origin: SEGAs most commonly occur in the wall of the lateral ventricle near the foramen of Monro. SEGAs probably arise from subependymal nodules in the ventricular wall of patients with TSC. They often present as a well demarcated intraventricular tumor that does not invade into the periventricular parenchyma. Concomitant subependymal nodules or cortical ganglioneuronal hamartomas (tubers) may be seen in the setting of TSC. Focal, firm lesions: SEGAs are focal discrete neoplasms that are firm, often calcific, and show cyst formation. They are sometimes vascular tumors that may have a gross angiomatous appearance. Natural history unknown: The natural history of the SEGA is unknown. What causes an otherwise unremarkable subependymal nodule in a patient with TSC to transform into a SEGA is unknown (28). Histogenesis: The histogenesis of SEGA is unclear, with evidence supporting both neuronal and astrocytic lineages. TSC is an autosomal dominant genetic disorder caused by mutations in either the TSC1 gene (chromosome 9) or the TSC2 gene (chromosome 16), which encode hamartin and tuberin, respectively. These proteins form an intracellular complex involved in the regulation of the cellular growth and energetic pathways, through the inhibition of the mammalian target of rapamycin (mTOR) within the akt-mTOR-S6 kinase cell growth trail. TSC1 and TSC2 genes: In 85% of patients, TSC may arise from a mutation in one of two genes, TSC1 (hamartin), with loci on 9q, or TSC2 (tuberin), with loci on 16p. These genes code for tumor suppressor protein complex, whose functions include the regulation of the mTOR pathway, which stimulates cell growth. The functional tumor suppressors hamartin and tuberin cause a down-regulation of the mTOR pathway targets TSC S6K1 and 4E-BP1, while mutations increase these products. The mutations lead to benign tumors in multiple organs, including the brain and heart (18). mTOR inhibition and rapamycin (now known as sirolimus): The mTOR signaling pathway is manipulated by treatment with rapamycin, which has been studied in trials for tumor control (5, 6, 24). This drug is a commercially available immunosuppressant that inhibits T-cell proliferation. Studies have been conducted with everolimus, a rapamycin derivative that is similar to rapamycin in that it also is an mTOR inhibitor (19, 20). Everolimus has been recently approved for treatment of SEGA and is commercially available. These studies show a reduction in SEGA volume of more than 50% in 32% of the patients; however, long-term studies are still required for assessing treatments other than neurosurgical resection. Histology: SEGA is composed mainly of large plump cells resembling astrocytes or neurons. These giant cells (also known as balloon cells) are the neuropathological hallmarks of SEGA. They have prominent nuclei and nucleoli and abundant, glassy, eosinophilic cytoplasm. 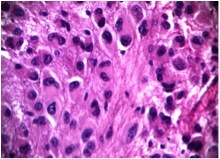 Mast cells and calcification may occur in some cases. 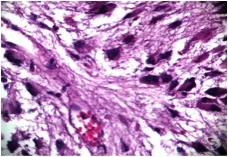 Other common features include perivascular pseudopalisading and clustering of tumor cells (17). Subependymal giant cell astrocytoma, H&E stain: Note the pleomorphic multinucleated eosinophilic tumor cells with no mitosis. Subependymal giant cell astrocytoma : Note the clustering of tumor cells with perivascular pseudopalisading.